This image of Comet 67P/Churyumov–Gerasimenko was taken while the Rosetta spacecraft was flying 17.3 miles (27.8 kilometers) from the comet on Sept. 10. A probe flying through deep space has been beaming back amazing photos and information about its target comet since arriving at the cosmic body in August. After a 10-year trek through the solar system, the European Space Agency's Rosetta spacecraft has made some amazing discoveries about Comet 67P/Churyumov–Gerasimenko. From its color to its shape, mission controllers have been surprised by Rosetta's seemingly odd target. And more weird findings could be on the horizon. Rosetta could help scientists probe the origins of life in the solar system or even uncover some of the long-standing mysteries surrounding how a comet works as it flies near the sun. Rosetta has been traveling through space with another spacecraft, the Philae lander. Philae is designed to fly down to the comet's surface and study it in tandem with Rosetta. Because of the comet's incredibly low gravity, engineers had to be somewhat creative in coming up with a way to land the probe safely on the celestial body. When Philae reaches the surface of the comet, the lander will harpoon itself into place to keep it from ricocheting back off into space. Comets are balls of ice and dirt left over after the dawn of the solar system, and some scientists think that they hold a key to understanding how the planets formed and why they are so diverse. By studying Comet 67P/C-G, researchers think they might start to learn more about how comets formed in the early days of the solar system millions of years ago. The organic material of comets could have contributed to Earth's water and even the beginning of life on the planet. "We desperately need to know the composition [of comets] because in that composition we might have an idea of what is really specific to what will lead to life," Jean-Pierre Bibring, lead lander scientist for the mission, said during the news conference. "Of course the next question will be: Is that specific to the way our solar system evolved or is it a truly generic process in the universe?" Comets also might be responsible for delivering most of the water on Earth to the planet when it was forming. "The question of whether or not we're alone in the universe is really directly connected to what we're looking for here," Bibring added. 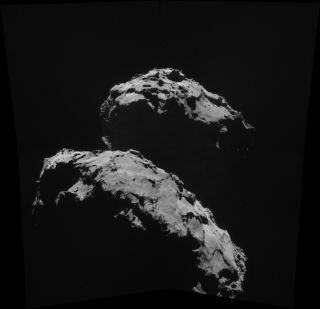 Some of the first data collected by Rosetta once it was near the comet shows that Comet 67P/C-G is incredibly dry. Scientists expected to see patches of ice on the comet's surface because it is currently flying so far from the sun, but they didn't find large patches of ice. Instead, the analysis showed that the comet is actually dark and dry. "In our view, the surface is dry," Sierks said. "It's dry like hell, so there is no way to slip on the surface." Researchers expect that as the comet gets closer to the sun, it will become more active as its particles react to the heat of the star. More early data sent back by Rosetta shows that the comet is actually incredibly dark in certain wavelengths of light. Comet 67P/C-G is darker than charcoal in ultraviolet wavelengths, according to the new research. "We're a bit surprised at just how unreflective the comet's surface is and how little evidence of exposed water-ice it shows," Alan Stern, Alice principal investigator at the Southwest Research Institute in Boulder, Colorado, said in a statement. Comet 67P/C-G doesn't look like anything scientists expected to find. Instead of finding a round icy body, Rosetta was greeted by an odd, "rubber ducky"-shaped comet. The comet appears to have two lobes: a "head" and a larger "body" connected by a relatively thin neck. Philae's landing site is located at Site J, a sunny but rocky location on the head of the comet. But Comet 67P/C-G may not have always looked that way. "It's certainly not born in the shape we see it today," Sierks said during the news conference. "It might even be a fragment of a far larger comet, so this comet is not a typical-sized comet. So, it might be just a fragment that then evolved to the shape we see it [in] today."